..the masses will never learn to conduct the political struggle until we help to train leaders for this struggle, both from among the enlightened workers and from among the intellectuals. Such leaders can acquire training solely by systematically evaluating all the everyday aspects of our political life, all attempts at protest and struggle on the part of the various classes and on various grounds. Therefore, to talk of “rearing political organisations” and at the same time to contrast the “paper work” of a political newspaper to “live political work in the localities” is plainly ridiculous. Propaganda or the education of an entire population was both visual and verbal, and visual culture was the realm of the artists, who marshaled their considerable talents and skills and gave themselves over the government. Art was dead. The artist was dead. In the place of such bourgeoisie concepts, the engineer emerged full of projects and pictures and objects, all aimed towards propaganda. By the end of the Great War, an otherwise neutral word, “propaganda,” meaning persuasion or a spreading of a certain message, had morphed from a doctrinaire teaching of a received truth, such as that from a religious organization, or, on a lower level, the semiotics of selling a product, to a campaign to teach the audience to hate. During the War, vast and sophisticated machineries, based in the governments of the contending powers, cranked out posters, articles in newspapers, books, primitive films, even postcards, shaped stories and crafted messages with one goal in mind: to stir up the feelings and emotions of the people to hate the other side. In England, a nation without a universal draft, the messages were ones of shaming fit young men into serving in the military. In France, the content was simple, the Germans were barbarians. In Germany, the story was that the British Empire surrounded the world like a giant octopus. However, when the exiled leaders of the Russian Revolution returned to their homeland, joining those who had stayed behind to fight directly against the Czar, a sophisticated machinery had been honed through years. Aided by intellectuals and abetted by artists, all of whom came from the small middle class, the fight for the hearts and minds of the lower classes began. The earliest posters were plastered onto the windows of the Rossiiskoe Telegrafnoe Aganstvo, or ROSTA, the Russian Telegraph Agency, located in cities from Moscow to Petrograd to Odessa and points beyond. 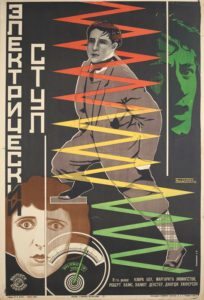 ROSTA had its own Moscow-based art department until 1921 and its posters were the joint products of an artist, Mikhail Cheremnykh, and a journalist Vladimir Mayakovsky (1893-1930), who directed a project that eventually employed local teams beyond Moscow. Given that this endeavor existed for only two years and yet over two million posters were distributed. Although the founders of the program were sophisticated, the audience was working class and largely illiterate. To reach this audience, which needed to be informed of the latest news, the ROSTA artists appropriated the look of a lubok or traditional Russian folk art print was deployed. Avant-garde artists, such as Ivan Maliutin, were recruited to communicate with a public that had a horizon of expectations limited by a low level of literacy and a visual acuity trained by Russian icons. 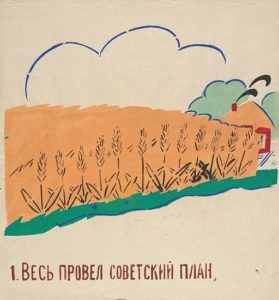 The Russian people could read images fluently and the simple narrative style of the ROSTA posters—rather like cartoon drawings—could be easily followed. The Bolsheviks needed to convince the people of the righteousness of their philosophy, one of empowering the working class, de-legitimating the ruling class, and establishing a centrally controlled economy valorizing the laborers. ROSTA text was kept to a minimum and the weight of the message rested upon simple but graphically effective images. Vladimir Mayakovsky. Sowing Campaign: Let’s fulfill the decree! In February 1919, the painter and caricaturist Mikhail Cheremnykh in collaboration the journalist Nikolai Ivanov started an artistic campaign in the shop window of an empty confectionery with a visually designed news agency report. The campaign was to last three years, from the devastating period of the civil war to the introduction of a rudimentary market economy. The initiative was taken up a few weeks later by the popular revolutionary poet Vladimir Mayakovsky, who had recently caused a stir with the publication of an anthology of his futuristic poems and the performance of an elaborate satire spectacle, the “Mystery Bouffe”. When passing by one of Cheremnykh’s ROSTA windows, it seemed he immediately grasped the potential of the initiative. If one can believe his own accounts and those of his hagiographer, Mayakovsky soon functioned alongside Cheremnykh as the spiritus rector of a constantly growing illustrated news collective. These posters told stories, sent messages, taught lessons with images that would have been at home in a child’s picture book. The colors were bright and arbitrary, applied by assistants who would work from a basic linoleum block, allowing the strong colors to run outside the lines. The result was an image that was friendly and persuasive, sophisticated and amateurish at the same time, with the folkish charm selling strong political messages. In 1921, ROSTA was abruptly shut down by the new government, and its windows were closed so to speak, and the large brilliant posters disappeared. But the way in which the agency was run would be typical of propaganda efforts: workers would be radicalized or co-opted to the cause and there could be no deviation from the party line. The concise and consistent message would dominate and it was the task of the artist to become an engineer in the service of the permanent revolution. Following the civil war and the consolidation of power, the Communists then set out to transform and unify the vast Russian territories to knit them under the Soviet rule and way of life. The railroads, the one accomplishment of the Czarist regime became avenues of education as the new government reached out to the masses. 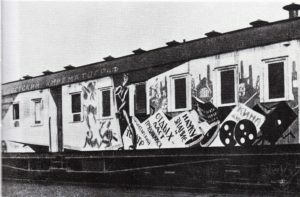 Long agitprop trains, painted on the exterior with colorful designs that captured the eye and informed the mind traveled everywhere, pausing at towns and small cities. The populations would gather around to receive information, written, verbal and visual, on topics from best practices in health and the values of Communism. The workers, the peasants and the downtrodden learned that they were now heroes, enlisted in the great revolution of the Russian people, now powerful and in charge of their own lives. The visuals of these agitprop trains were closer to ROSTA posters than to the avant-garde posters of the cities, where the audience was more sophisticated. In the 1920s, there was still no set aesthetic for the Revolution and the avant-garde artists moved into the vacuum and gave their lives to Communism. But the story of the Russian avant-garde artists in post-revolutionary Russia is nothing short of tragic. The artists, mostly from Moscow and Petrograd, had been politically left-leaning before the Revolution and most enthusiastically joined the new government with high hopes and good intentions. They willingly gave up the pretensions of “avant-garde” and happily become workers, engineers, and cultural producers, reinventing themselves in the cause of the workers and in the name of the Bolshevik creeds. For a few short years, these artists flourished and were appreciated, supported by the young government, but a revolution never stops, it is only paused from time to time. By the time it reached its natural end—the evolution of a strong totalitarian leader—Stalin—avant-garde art and artists were purged and silenced. Russian avant-garde graphic design and its fate were a case study of the trajectory from aspiration to suppression. Containing the stylistic seeds of their own destruction, the avant-garde posters designed by the Russian avant-garde artists were everything the ROSTA posters were not. Rooted in Suprematism and Cubism and Futurism, rather than in folk art, borrowing the tactics of photomontage rather than simple block printing, these posters were complex, not simple, and often constructed on the strong diagonal, giving the images a feeling of dynamism and a sense of change and progress, they were more artistic than communicative, with an alienating aesthetic that put off the masses at which they were aimed. The artists did not help their cause by debating among themselves about which avant-garde style would be appropriate for the masses. Given that Futurism, for example, was Italian rather than home grown, the use of pre-war styles seems out of step with the main goal of the artists, which was to create a new visual universe, full of new objects, in which a new language would appear and communicate the meaning of the brave new world. The new language would be that of the proletariat. But despite the obvious complications, the artists proceeded along their own path to what historians John E. Bowlt and Olga Matich described as “the leftist artists and writers snarled relationship to power and language as the media of political control.” Indeed, as the writers continued, “the avant-garde artist can be seen as the politician’s rival who usually loses the battle to the more powerful opponent.” It is possible to make the argument that the Russian avant-garde ended for all intents and purposes with the end of the Great War, and, after that, the artists carried their memories and their styles from non-revolutionary bourgeois contexts forward with them into a revolution for which this language was profoundly unsuited. Yet out of this ultimately unsuccessful relationship came some of the most striking designs of the twentieth century.